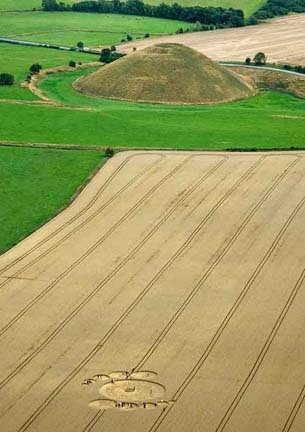 Above and below: Afternoon of Monday, August 3, 2009, was the first anyone knew that this new wheat pattern was near Silbury Hill. Aerial image © 2009 by Olivier Morel, WCCSG. 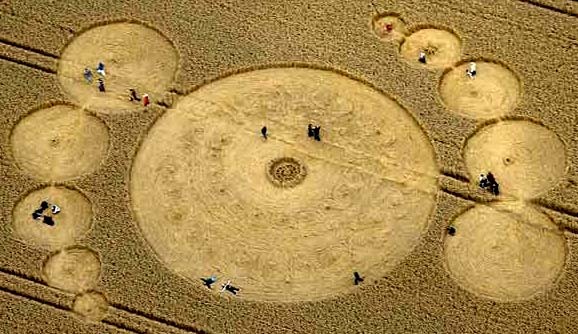 August 5, 2009 Yatesbury, Wiltshire, England - Mid-day on August 3, 2009, photographer and crop circle researcher Frank Laumen from Germany was driving on the road near Silbury Hill when through a gap in the trees, Frank could see something in a wheat field at the base that was definitely not there the night before when he and his German colleague, Andreas Mueller, had driven by after visiting the Morgan's Hill pattern reported August 2. Frank used his cell phone to call Andreas in another car behind him and they stopped to get into the field.